Sunday Afternoon - Seurat tapestry shows a sunny afternoon scene by Georges Seurat (1859-1891). A French post-impressionistic painter, he innovated art with the technique of pointillism. 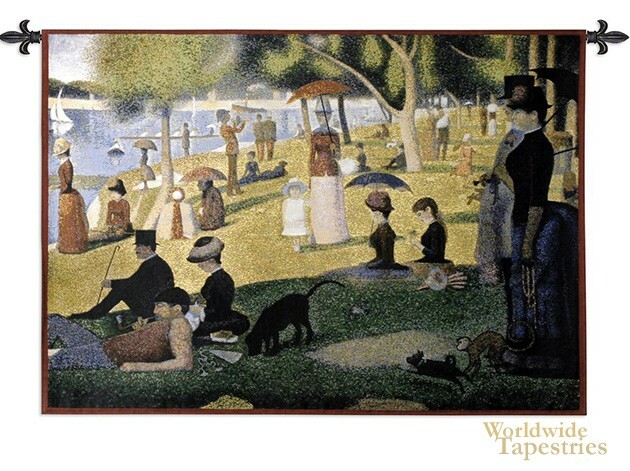 In this work A Sunday Afternoon on the Island of La Grande Jatte, which shows each social class enjoying the lakeside park land. The original is in the Art Institute of Chicago. A smaller version is in the Metropolitan Museum of Art in New York. Here we see people from the city in beautiful dress, hats and umbrellas with some pet dogs on the green lawn beside the lake with boats. The sun is illuminating the park beyond the shade in the foreground. This Sunday Afternoon - Seurat tapestry is backed with lining and tunnel for easy hanging. Note: tapestry rod and tassels, where pictured, are not included in the price.